I heard about Revlon Colorburst Lip Butter from many reviews on blogs and Youtube videos, and they were all saying this lip butter was Ah-Mazing! 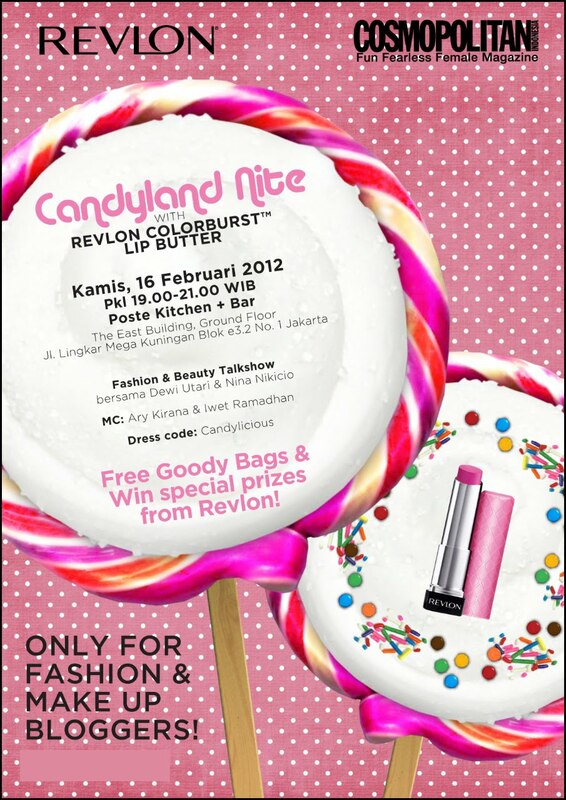 Then suddenly one day, someone from Revlon called me and invited me to come to their new launching of this product! Revlon was collaborating with Cosmopolitan for this event. I was surprised and really couldn't wait to come and try all those Lip Butters. 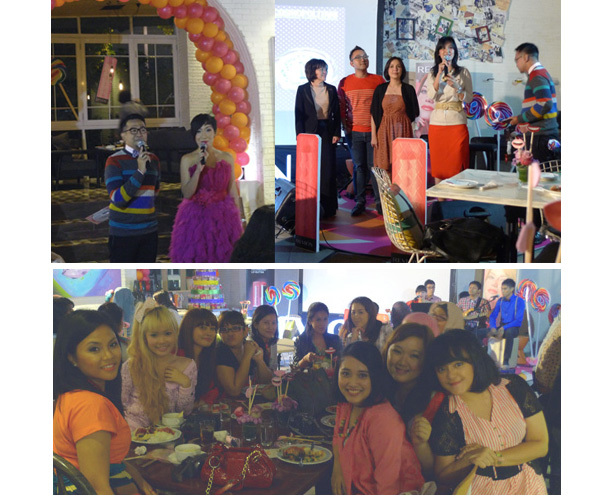 The event was specially held for Fashion and Beauty Bloggers on Thursday, 16th February at Poste Bar and Kitchen, Kuningan. The dresscode was "Candylicious". 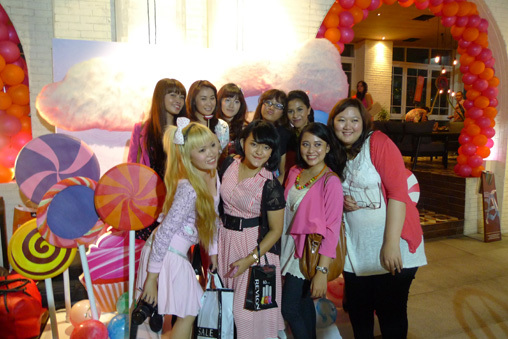 I decided to wear my pink stripes vintage dress :D.
I finally arrived at 7.10pm and met some of my friends, Stella, Nisa, Ceecille and I also met new friends from other fashion and beauty blogs. Heylloooo Carryn, Mada, Marcelle, and you ^_^. 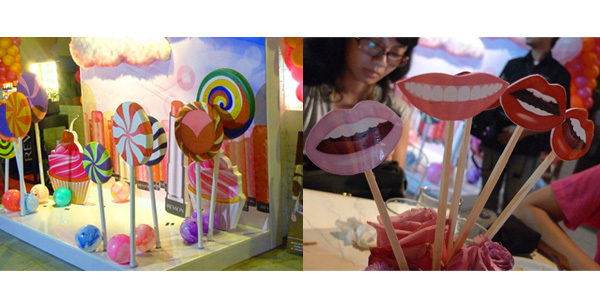 The venue decoration was really colorful, they had many giant lollipops and cupcakes, and I felt like entering a super cute and candylicious place in the middle of Jakarta's traffic. At that night I wasn't hungry and I prefer to walk around and made new friends instead, so I just took a bowl of cream soup. In the middle of enjoying our dinner, we were pleased to try their new Colorburst Lip Butter. The product is a combination between lipstick and lipbalm. So it has a color and also a moisturizer for our lips that contains of mango butter, shea butter and also coconut butter. They launched 20 colors of shade and the packaging is so cute. They have a semi-transparent cap with various colors that match with the colors of the Lip Butter. My favorite is Tutti Fruity, the color is orange coral. 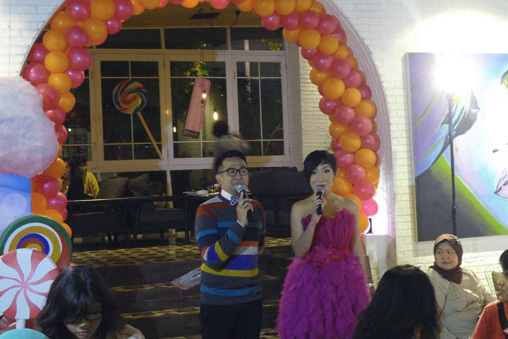 They also introduced Nina Nikicio and Dewi Utari as guest speakers at that night. Nina is a fashion designer of Nikicio and Dewi Utari is Fashion Blogger, also Fashion Editor for Harper's Bazaar Indonesia. They were talking about fashion trends and also fashion tips and tricks. 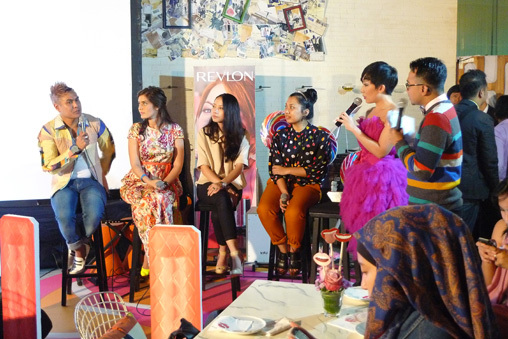 They also introduced Hendro Revco, Revlon Make Up Artist and also Carissa Putri as a Local Ambassador. After the talkshow, they threw a make over game. They chose 3 beauty bloggers to collaborate with other 3 fashion bloggers. 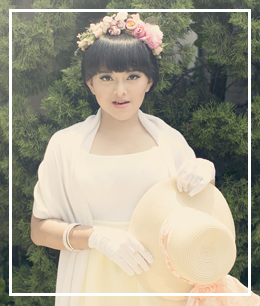 I was chosen to be part of the game, and I was collaborating with a fashion blogger (I'm sorry i forgot your name :( ). We had to mix and match clothes and also do a makeover using the make up that they provided us. And WE WON the game! ahahahahaha..
We got Sogo voucher worth of Rp 250.000. After the game they also chose 10 winners of doorprize. and I WON AGAIN! hahahahaha.. I got mascara, eyeshadow pallete and also lip gloss. That day was truly my lucky day!!! 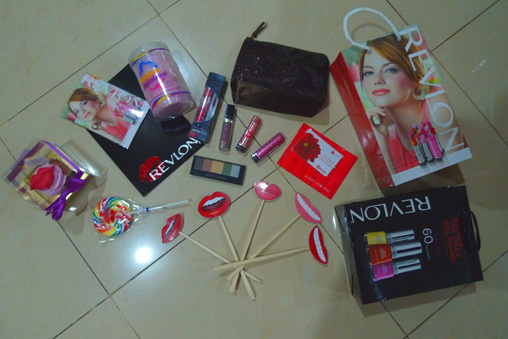 Before we went home, Revlon gave us goody bag contains of a lot of things. It was really hard to keep all those stuffs, my hands were really full of free stuffs. They gave us cotton candy, lollipop, 2 cupcakes, Hello! Magazine and of course 2 Revlon Lip Butter! Yeay!! Thanks Revlon and Cosmopolitan. You both made my day! @vanilavheii yes, i was so lucky,,, ahahahahhahahaha..